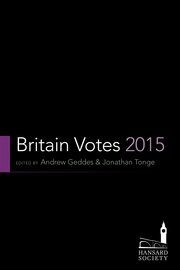 In the edited collection Britain Votes 2015, editors Andrew Geddes and Jonathan Tonge present essays analysing the main issues and outcomes of the 2015 UK General Election. Offering a concise and well-rounded account of an election often promoted in the media as one of the most unpredictable of recent times, this book is recommended reading for students of contemporary British politics, writes Gordon Bannerman. Britain Votes 2015. Andrew Geddes and Jonathan Tonge (eds). Oxford University Press. 2015. Taking its place in the competitive field of electoral studies, the Hansard Society/Oxford University Press collaborative publication Britain Votes 2015, co-edited by Andrew Geddes and Jonathan Yonge, features fifteen essays by leading scholars bookended by an editorial introduction and conclusion. While ambitiously wide-ranging in its examination of all aspects of the electoral campaign, including political parties, party finance, the media and the constituent parts of the United Kingdom, the book’s core themes largely reflect the main issues and outcomes of the 2015 General Election. In the months preceding the Election, most media organisations and political experts promoted it as one of the most unpredictable in modern times. The political map of Britain was richly colour-coded in accordance with a more complex party configuration, and ‘Coalition Government’ and ‘Hung Parliament’ were oft-cited terms. It was therefore surprising when exit polls on election night indicated a Conservative majority. The nature of that victory; Labour’s failure to increase its vote share, especially in England; the rise of the Scottish National Party (SNP); and the Liberal Democrats’ disastrous losses: these are all, predictably, given considerable prominence within the volume. While acknowledging that elections are complex affairs, the editors bluntly assert that there ‘is no need to over-complicate explanations’ of the result (256), which they primarily attribute firstly to the belief among a large section of the electorate in the Conservatives’ economic competence, and secondly to public perceptions of Prime Ministerial authority and competence that consistently favoured David Cameron over Ed Miliband. As Bale and Webb compellingly argue, leadership evaluations may be a good indicator of party popularity and electoral success, acting ‘as a heuristic simplification’ to guide voters when policy debates become too complex to fully understand (51). Cameron certainly proved adept at presenting a nuanced political identity to the electorate, promoting liberalism in social policy without compromising core Conservative values, whilst constantly attacking Labour’s record on the economy, welfare and immigration. Indeed, the economic narratives of Labour over-spending and economic mismanagement and the necessity of deficit reduction were central components of the Coalition Government and Conservative campaign. The Emergency Budget of June 2010 began the narrative of crisis, which was relentlessly fostered throughout the life of the Parliament. Labour’s response was ineffective, piecemeal, often incoherent and contradictory and it also failed to remove the association in the public mind between Labour and ‘tax and spend’ policies. The SNP’s anti-austerity message presented the Conservatives with the opportunity to reinforce core themes, with the promotion of a dual narrative powerfully articulated positively in terms of competent economic management and strong leadership, and negatively in terms of Labour’s economic incompetence and the danger of a Labour/SNP ‘Coalition of Chaos’ (257). The key drivers of debate and voting intention – identified as ‘valence’ issues, where agreement exists as to desired ends – partly responded to traditional political configurations, with the Conservatives leading on economic management and Labour more trusted with the NHS. However, from the Coalition’s failure to restrict migrant numbers, The UK Independence Party (UKIP) secured a degree of ‘issue ownership’ over immigration and Europe. While potentially a development of long-term significance, the siloed nature of policy preferences appears to be further evidence of political fragmentation. Despite this shift in opinion, which was not actually reflected in the composition of the Parliament, many areas, notably Wales and Northern Ireland, saw little change in patterns of political loyalties and allegiances. The more technical aspects of electoral analysis and patterns of electoral behaviour are subject to intensive scrutiny. The central psephological aspect was the efficient distribution of the Conservative vote, characterised by winning more seats with small majorities, while Labour wasted votes in constituencies won by other parties. The imbalance in voter turn-out, with older and wealthier people more likely to vote, also favoured the Conservatives. Other developments, notably the declining number of marginal seats and the micro-targeting of voters – conducted particularly effectively by the Conservatives in key Liberal Democrat-held seats – appear potentially far-reaching in their future application. It was not primarily the Liberal Democrats (‘the usual suspects’) who suffered from the imbalances of the first-past-the-post system against parties whose support is geographically wide rather than deep. This time UKIP were unwilling recipients of the democratic deficit; with nearly four million votes they secured only one seat, whereas the SNP with approximately 1.5 million votes won fifty-six seats. If these glaring anomalies are depressingly familiar, patterns of electoral participation and influence identify some surprising trends. Social media appears to have played a somewhat negligible role in campaigning terms, and all parties were inconsistent in using it. Celebrity endorsements and interventions were peripheral, and the impact of television debates highly variable and perhaps short-lived. These valuable insights supplement the statistical base of electoral analysis and provide a commentary on the zeitgeist of modern Britain. Projecting forward, a rather speculative concluding essay holds out the possibility of Labour revival arising from slow disenchantment with Conservative policies amid second-term uncertainties and vicissitudes. In light of Jeremy Corbyn’s election as Labour leader post-publication, the editors may want to rethink that prospect, having voiced the opinion that any leftward shift ‘lacks electoral logic’ (260). Indeed, by reviving a more pronounced left/right dichotomy, the ‘Corbyn factor’ may solidify Conservative support. Equally, continuing austerity, an EU Referendum and intermittent constitutional instability in Scotland and Northern Ireland make it likely that the 2020 election may also be promoted as one of the most unpredictable of modern times. In presenting a concise, analytical and well-rounded account of the 2015 General Election, Britain Votes 2015 succeeds in its primary objective. The essays are assiduously researched and underpinned by a battery of statistical, contextual and anecdotal evidence. Inevitably, there is sporadic overlap and reiteration, but each essay is characterised by informed content and pointed analysis. By convincingly demonstrating the multi-faceted elements that influenced the campaign and result, the book is greater than the sum of its parts. Most pertinently, the configuration and architecture of the electoral system and the resources required to operate effectively within it, the prevailing economic narratives which had developed between 2010 and 2015 and the increasing importance of leadership qualities, all pointed towards, and largely explain, the Conservative victory. Ultimately, explaining outcomes are the fundamental purpose of electoral studies, and the skilful analysis contained within this informative and authoritative volume makes it recommended reading for scholars of contemporary British politics. Dr Gordon Bannerman is a private tutor, researcher, writer and author based in Dundee. He received his PhD from King’s College London, in 2005, having previously studied medieval and modern history at the London School of Economics and King’s College London (BA: LSE, 1997; MA: KCL & LSE, 1998). He has previously taught Modern British History at the University of Dundee, King’s College London, and the London School of Economics. Read more reviews by Gordon Bannerman.